Imagine that there are two providers of the same service. Their quality and timeliness are comparable. However, one provider charges significantly more than the other. In a normally functioning market, you would expect that the more expensive provider would have to significantly change its cost structure to stay in business. The Medicare Payment Advisory Commission (MedPAC) has argued that the fees should be “site neutral” for many procedures. President Obama’s budget proposes to phase this in starting in 2017, and estimates savings of $29.5 billion over ten years (p. 65). This is something I've seen a lot. A hospital buys a clinic. The clinic keeps the same doctors, seeing the same patients. Nothing about the building changes. But the cost of the medical care increases significantly just because the ownership changed. That's wrong and needs to stop. I support this piece of President Obama's budget. Dr. Pauline Chen, writing at the New York Times. The researchers then compared these outcomes to those of patients who were not covered by Medicare and therefore not restricted to having their operations done at centers of excellence. Even after adjusting for individual patient risk factors and the specific type of bariatric procedure performed, they found no differences in complication rates or outcomes between Medicare and non-Medicare patients. Moreover, they discovered that many of the improvements had been under way prior to 2006. In other words, the much-heralded policy of funneling patients to centers of excellence has had little effect on how patients do. Over the past several years, I've seen lots of people talking about how this or that government program fixed this or that problem in the United States. And, almost invariably, I'll see economists pointing out that the trend line was already declining before the government got involved and that the government's involvement did nothing to speed up the change. Without this research, this Medicare policy would have received the same praise even though it, too, deserves none of the credit. Avik Roy, on a very promising development from the AMA. At the Vice-Presidential debate last week, Joe Biden claimed that the American Medical Association sided with him, and against Paul Ryan, on the merits of the Romney-Ryan plan for Medicare reform. “Who do you believe?” exclaimed Biden. “The AMA [and] me? A guy who has fought his whole life for this? Or somebody [like Paul Ryan]?” Well, it turns out that the AMA’s key policy committee has come out in favor of premium support for Medicare, in a fashion that tracks closely with what Mitt Romney and Paul Ryan are proposing. Veronique de Rugy is worried that Romney / Ryan's talk about "protecting Medicare" means that they won't really push to reform it. She lays out all of the reasons why Medicare desperately needs to be reformed, if it's to survive at all. It's worth a read, especially if you're not convinced about the necessity of reforming Medicare. Yuval Levin fact checks a Paul Krugman column about Paul Ryan's speech and about Medicare reform. Yuval demonstrates (with copious links to evidence) all of the ways in which Paul Krugman is wrong about Medicare, wrong about Ryan's plan. It's the best single summary of everything wrong with Medicare that I've seen yet—and it explodes quite a few myths about Medicare's affordability, sustainability, and efficiency. To begin with, many of Medicare’s most significant administrative costs are just covered by other federal agencies, and so don’t appear on Medicare’s particular budget, but are still huge costs of the program. The IRS collects the taxes that fund the program; Social Security collects many of the premiums paid by beneficiaries; HHS pays for a great deal of what you would think of as basic overhead, but doesn’t put it on the Medicare program’s budget. Obviously private insurers have to pay for such things themselves. Medicare’s administration is also exempt from taxes, while insurers pay an excise tax on premiums (which is counted as overhead). And private insurers also spend a great deal of money fighting fraud, while Medicare doesn’t. That might reduce the program’s administrative costs, but it greatly increases its overall costs. Some administrative costs save money, after all: The GAO has estimated that a $1 investment in pre-payment review of claims, for instance, would save $21 in improper Medicare payments. It's worth reading the entire thing. Especially if you think Medicare doesn't need to be changed. On Saturday, the Obama campaign released this ad attacking the Romney Medicare proposal. The ad doesn’t walk some sort of narrow line between misleading and deceiving, it’s just simply a pack of lies from top to bottom. Yuval Levin provides his own analysis of a recent Obama campaign ad, related to Medicare reform. Democrats making things up about Republican reform plans? I'm shocked, simply shocked! An oldie from August, that I've been hanging on to, for some reason. Veronique de Rugy breaks down S&P;'s memo about why they downgraded US debt to an AA+ rating. In other words, to avoid a downgrade, it would have been key in S&P’s opinion to show signs of willingness to cut (contain) Medicare and other entitlement spending. That didn’t happen, since many lawmakers in Congress (Democrats mainly, though not exclusively) refuse to talk about how much we can really afford to spend on Social Security, Medicare, Medicaid, and other social programs. As a result, it is difficult to claim that the Republicans’ unwillingness to raise revenue is the only reason for this downgrade. It seems to me that there is enough blame to go around. When you get Medicare and Social Security benefits, you're not really getting "your" money back. In many cases, you're getting back far more than you paid in and the whole system isn't designed to make that kind of math work. Our recent analyses of lifetime contributions and expected benefits in Medicare show that, over a wide range of scenarios, beneficiaries retiring at age 65 in 2011 can expect to receive dramatically more in total benefits than they have paid in dedicated taxes. For example, single beneficiaries and dual-earner couples who had earned the average wage throughout their working careers can expect to receive about $3 in Medicare benefits for every $1 paid in Medicare payroll taxes. If only one member of the couple had worked, we calculate a six-fold difference between contributions and benefits since both spouses are eligible for Medicare yet only one has paid taxes. Higher earning workers will have paid somewhat higher Medicare taxes, but their expected lifetime benefits still far outpace their lifetime contributions. Social Security benefits and contributions come closer to balancing out over the lifetime for many beneficiaries (middle panel), but the one-earner couple again comes out far ahead due to a Social Security system that was designed decades ago around the stereotypical family of the past, with a working father and a stay-at-home mother. While a single woman who worked a full career at the average wage can expect to receive Social Security benefits roughly in line with her payroll contributions, a married woman who never worked but whose husband paid the same taxes as the single woman can expect to receive about $180,000 in spousal and survivor benefits. Unlike private pensions, these additional benefits are essentially free but only to those who are married, regardless of need, contributions or any child rearing. They are financed by all Social Security taxpayers, including single mothers who get no spousal or survivor benefits at all. Examining both programs together (bottom panel) highlights the large dollar value of benefits being paid out and the fact that total lifetime benefits consistently outweigh lifetime contributions across a range of scenarios. It is no wonder these programs now account for one-third of all federal spending each year. Furthermore, our projections for people retiring in 2030 (data not shown) reveal a continuation of the difference between benefits and contributions under the current unsustainable structure of these programs. Richard Hannon, an executive for Blue Cross Blue Shield of Arizona, wrote an opinion editorial for the Wall Street Journal yesterday. In How Medicare Killed the Family Doctor he talked about how Medicare's costs exploded between 1965 (when it was created) and 1990. In 1966, the Medicare budget was a mere $3 billion. At that time, the House Ways and Means Committee estimated that the budget would grow to only $12 billion by 1990. Instead, it was $107 billion by 1990. To fix the cost problem, Medicare in 1992 began using the "resource based relative value system" (RBRVS), a way of evaluating doctors based on factors such as education, effort and specialized training. But the system didn't consider factors such as outcomes, quality of service, severity or demand. Today most insurance companies use the Medicare RBRVS because it is perceived as objective. As a result of RBRVS, specialists--especially those who perform a lot of procedures--do extremely well. Primary-care doctors do not. In short, this is one of the major problems of a third-party payment system. Doctors aren't evaluated and paid by patients based on how good they are, how popular they are, or how effective they are. Instead, someone other than the patient judges a doctor's value and pays him according to a strict pay scale. Doctors have little to no ability to raise or lower prices or to set one price for a bundle of services. This third party payment system sharply limits the way doctors can compete for patients or appeal to patients for business. It also sharply limits the ability of the patient to reward the doctor for good service or punish the doctor for poor service. When that kind of feedback is eliminated, is it any wonder that we spend more time waiting in clinic waiting rooms than we do actually seeing the doctor? Or that the doctor can often seem more interested in hustling us out the door instead of listening to our medical history? Our doctors do not work for us, they work for the insurance companies. And that's a big problem with third-party payment for medical care. A government analysis of the new health care law says it will not slow the overall growth of health spending because the expansion of insurance and services to 34 million people will offset cost reductions in Medicare and other programs. The study, by the chief Medicare actuary, Richard S. Foster, provides a detailed, rigorous analysis of the law. In signing the measure last month, President Obama said it would "bring down health care costs for families and businesses and governments." But Mr. Foster said, "Overall national health expenditures under the health reform act would increase by a total of $311 billion," or nine-tenths of 1 percent, compared with the amounts that would otherwise be spent from 2010 to 2019. This analysis isn't really a surprise to me. 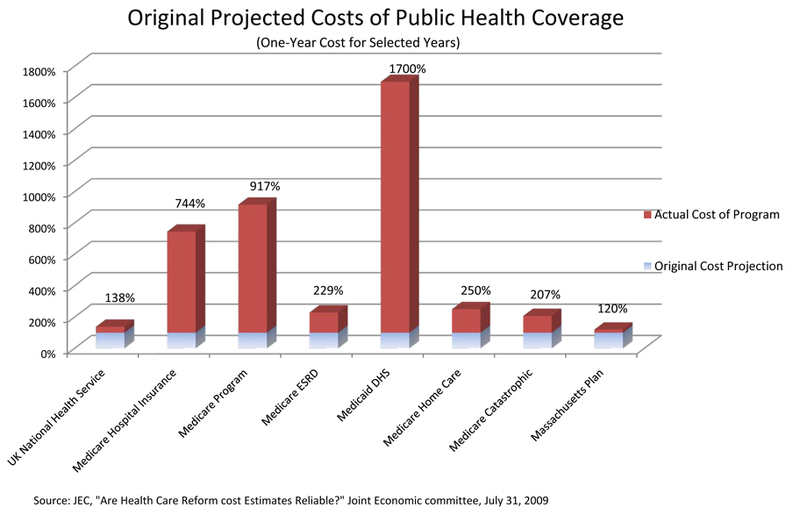 It seems pretty obvious that adding lots and lots to uninsured people to Medicare will increase costs by quite a bit. And, this picture, is actually a best case scenario. It assumes that politicians won't act like politicians. Mr. Foster says the law will save Medicare more than $500 billion in the coming decade and will postpone exhaustion of the Medicare trust fund by 12 years, so it would run out of money in 2029, rather than 2017. In addition, he said, the reduction in the growth of Medicare will lead to lower premiums and co-payments for Medicare beneficiaries. But, Mr. Foster said, these savings assume that the law will be carried out as written, and that may be an unrealistic assumption. The cuts, he said, "could become unsustainable" because they may drive some hospitals and nursing homes into the red, "possibly jeopardizing access to care for beneficiaries." If you believe that politicians are actually going to cut payments to Medicare physicians and hospitals, then you obviously haven't been paying attention to the votes that have been taken in Washington over the last two decades. Congress loves to talk about cutting payments to Medicare. Then, every time the cuts come due, there's a bipartisan rush to postpone the cuts. Government spending is going up. Way up. Here's Warren Meyer, talking about the different types of rationing. So here is what it boils down to: For every product or service purchase, someone makes a price-value trade-off to determine if that product or service should be purchased for a given price in that particular instance. One option for making this decision is to have the person who actually will consume the product or service — and whose money will also be used to complete the transaction — make this price-value tradeoff. ... A second way to do this would be to have someone who has you specifically in mind make the price value tradeoffs for you. This might be like your wife volunteering to go out to buy you some new underwear. When it comes to your health care choices, who do you want making your decisions? I definitely want to make my own decisions and I think most Americans would agree with me. But the reforms that are on the table would cement the status-quo. The status-quo overwhelmingly encourages us to pre-purchase our health care through expensive health "insurance" policies. Then a bureaucracy will take a look at our care and decide what to reimburse and what to deny. That's true whether you're on an HMO plan, a PPO plan, or a government (Medicare / Medicaid) plan. Isn't it time that we had real reform? Isn't it time that we put patients back in charge of their own health care decisions? Jon R. Gabel writes in the New York Times today, saying that we shouldn't fear the cost of health care reform because the CBO has a long history of underestimating the savings from reforms. In the early 1980s, Congress changed the way Medicare paid hospitals so that payments would no longer be based on costs incurred. ... The Congressional Budget Office predicted that, from 1983 to 1986, this change would slow Medicare hospital spending (which had been rising much faster than the rate of inflation) by $10 billion, and that by 1986 total spending would be $60 billion. Actual spending in 1986 was $49 billion. The savings in 1986 alone were as much as three years of estimated savings. In the 1990s, the biggest change in Medicare came with the Balanced Budget Act of 1997, a compromise between a Republican-controlled Congress and a Democratic administration. ... The actual savings turned out to be 50 percent greater in 1998 and 113 percent greater in 1999 than the budget office forecast. In the current decade, the major legislative change to the system was the Medicare Modernization Act of 2003, which added a prescription drug benefit. In assessing how much this new program would cost, the Congressional Budget Office assumed that prices would rise as patients demanded more drugs, and estimated that spending on the drug benefit would be $206 billion. Actual spending was nearly 40 percent less than that. I find it interesting though that his savings numbers only extend out a few years. For instance, he talks about how much was saved in 1986, from the 1983 bill, but doesn't talk about hospital spending trends since then. How much has the 1983 bill saved over the past 26 years? He talks about how much money was saved in 1998 and 1999 as a result of the Balanced Budget Act of 1997, but he doesn't talk about how much has been saved in the intervening 10 years. Did the trend continue? 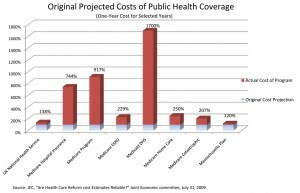 It looks like health care costs are underestimated far more than they're overestimated. Who's Better: Medicare or Private Insurance? But is that really true? Well, not if you hold up Medicare as an example of well-run government healthcare. This week, Scott Gottlieb wrote an interesting op-ed for the Wall Street Journal: "What's at Stake in the Medicare Showdown". First, there's a mistaken belief that Medicare is better staffed than private plans, and can therefore make better decisions about patients' clinical circumstances and the access to new therapies they should have. Yet at any time, Medicare has about 20 doctors and 40 total clinicians (including nurses) inside the coverage office, and fewer than a dozen in the office that sets the rates that doctors are reimbursed for the care they provide. Private insurers employ thousands of doctors, nurses and pharmacists, many experts in new technologies. Aetna has more than 140 physicians and about 3,300 nurses, pharmacists and other clinicians across its health plans. Wellpoint has 4,000 clinicians across its different businesses, including 125 doctors and 3,180 nurses. That works out to one clinician for every 9,000 people covered. United Healthcare employs about 600 doctors and 12,000 clinicians across all of its health plans and various health-care businesses. Private plans use clinically trained people to establish access to new technologies and services, but they also consult with doctors on a case-by-case basis, determining whether a product or service should be covered. Competition for beneficiaries means private plans need to provide better access for appeals, modern services and more personal considerations than what's offered by Medicare, a monopoly supplier. Recent data from Price Waterhouse Coopers found that private plans spend roughly four times more than Medicare on "consumer services, provider support, and marketing," which includes money spent answering the telephone to adjudicate individual issues. Smaller health plans use one clinician for every 10,000 beneficiaries. Medicare would need 4,500 clinicians to keep pace. One place where the clinician disparity is most obvious is the delivery of cancer benefits. Medicare doesn't have a single oncologist on staff, yet since the year 2000 the program issued, by my count, 165 restrictions and directives on the use of cancer drugs and diagnostic tools. A second common refrain is that Medicare is more efficient than private plans, spending less money per beneficiary to administer health services. But a lot of the money that private plans spend is on clinical specialists charged not only with reviewing individual cases, but also with ensuring that doctors and beneficiaries comply with plan contracts. Far from a selling point, not having these functions is one of Medicare's shortcomings. Medicare doesn't need to hire doctors to weigh individual medical cases because it uses formulaic rules made in Washington to set broad and inflexible restrictions on medical practice. Nor does the program need to hire clinical staff to monitor compliance. It passes costs for that on to the broader health-care system by backing up its rules with the threat of costly civil and even criminal sanctions. Providers and medical product developers spend hundreds of millions of dollars on systems, personnel and paperwork to ensure compliance with Medicare's sticky morass of regulations - tasks made more expensive by the fuzziness of the program's regulations and the arbitrary way they are enforced. When you put it that way, I'd far rather have my expenses reviewed by private insurance than by Medicare. Instead of an example to follow, Medicare looks like a cautionary tale of what not to do. I work with a lot of bright people. I wish they would question their assumptions more often and not just fall back on the tired rhetoric of "profit-seeking companies are bad" and "government programs really do help people".